Food waste is on everyone’s lips: Across Switzerland, around two million tons of edible food lands in the trash every year (source: WWF). The bottom line is that not only households, but also restaurants are throwing away too much food. At Yooji’s we’re making efforts to reduce food waste by discouraging overproduction and offering discounted products at the end of the day. 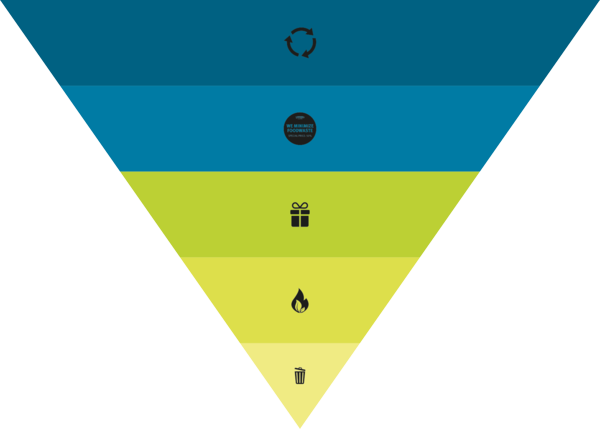 Exactly how we’re working to reduce food waste can be seen in the food-waste-pyramid below. The first step in our food-waste-pyramid is optimizing. We always do our best to give our customers a selection of varied and fresh sushi products, even right before closing time. Despite the best possible reaction to our customers’ demands, there are always some products left over at the end of the day. The leftover products are sold at reduced prices just before Yooji’s restaurants close. Our efforts to reduce food waste don’t end there. The products that we couldn’t sell, despite their discounted price, are given to our employees. The even smaller amounts of leftovers are then separated and processed into biogas. Despite all these efforts, should anything still be leftover, this minimal amount is then carefully separated and disposed of in the trash. The goal is to reduce this amount to 0%.